The Red Sea is a long, narrow strip of water that separates the coast of Egypt, Sudan, and Eritrea to the west from those of Saudi Arabia and Yemen to the east. The Red Sea is in the north, via the Suez Canal, connected to the Mediterranean Sea and in the south via the Strait of Bab el Mandeb with the Gulf of Aden (Arabic Sea) en the Indian Ocean. 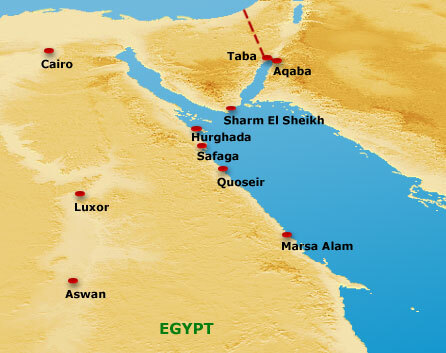 With its connection to the Mediterranean Sea via the Suez Canal, it is one of the most heavily travelled waterways in the world, carrying maritime traffic between Europe and Asia. At its northern end the Red Sea splits into two parts, the Gulf of Suez to the northwest and the Gulf of Aqaba to the northeast. In between we find the peninsula Sinai. The Red Sea is one of the first large bodies of water mentioned in recorded history. It was important in early Egyptian maritime commerce (2000 BC). It was also used as a water route to India by about 1000 BC. It is believed that it was reasonably well-charted by 1500 BC, because at that time Queen Hatshepsut sailed its length. Due to the limited supply of fresh water from rivers, scarce rainfall and high evaporation due to high temperatures, the Red Sea contains some of the world’s hottest and saltiest seawaters and it is exceptionally clear. Its name is derived from the colour changes observed in its waters. Normally the Red Sea is an intense blue-green. Occasionally, however, it is populated by extensive blooms of the algae ‘Trichodesmium erythraeum’ which, upon dying off, turn the sea a reddish brown colour.